BAYFRONT FUN FOR FAMILIES AND PETS !!! Please NOTE: only Saturday to Saturday rentals June, July and August. A VERY SPECIAL PLACE... Wonderful family home with large decks and screened porch. 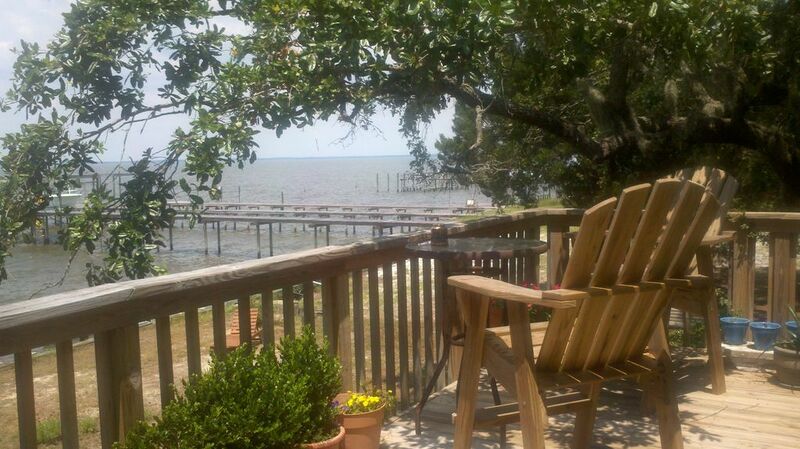 Relax on 2 heavily wooded bayfront acres. The house has 3 bedrooms and 2 baths with a greatroom/kitchen. Small man-made Beach. Bay. Also an Outside Shower! Pier for fishing and crabbing. Secluded and private but only 15 minutes to all the action. Across the road from Bon Secour Wildlife Refuge, where you can hike trails, and enjoy the most beautiful white sandy beach! Very nice place with great view. Quite and peaceful walks down the lane were enjoyable. We loved staying at Shellbanks!!! Melissa was amazing and quick at responding to any questions or comments. The house was amazingly stocked and the antique furniture and pieces were beautiful. The fishing wasn’t great but the beach she suggested was amazing. The sunsets off of the pier were beyond beautiful and so relaxing. We loved the house, location, and views. Thank you for allowing us to stay. We Had a wonderful stay and even the weather wasn't super warm we were still able to enjoy the pier and the lovely yard. The house was extremely clean and beds were very comfortable. Loved all of the closet space and the huge bar in the kitchen. This is by far one of the nicest rentals we have ever stayed at. Definitely snag this 1 if you can! My son and husband caught at least 10 fish over the course of 3 days. They were thrilled and husband even caught a stingray. We saw dolphins on our last afternoon. Thank you so much for a beautiful space for a relaxing week. We loved the house and it was very well stocked with everything we needed. The deck is amazing. The fishing was amazing. We saw dolphins our last day. Melissa was wonderful to work with. So much to do nearby. Quiet beach across the street. Only issue is the musty smell needs attention. Would love to come back. Everything about this property is wonderful. I love being near the bay and soaking in the live oaks and Spanish moss. The gulf beach is less than 5 minutes away. We enjoyed fishing and crabbing. The kitchen was great for family meals and cooking. This is a wonderful place for couples or families. The setting is tranquil and decor tasteful and relaxing. I’ve vacationed in ft Morgan several times before, but this was by far the best experience. Cannot wait to come back. From the moment you turn down the driveway you know you are on vacation. I can not say enough positive things about the house, location and the hospitality of Melissa. This was our first time not staying on the "beach" and I was a little worried the kids would be disappointed, just the opposite. They loved the open yard, private dock and the fishing. We will be back. Thanks Melissa, Shellbanks has a special place in our hearts. Bayfront Fishing, Swimming, and Boating. Gulf Beaches and Wildlife Refuge Trails just across the street. Many Attractions, Shopping, and Historical Fort nearby. PET FEES ARE 10% FOR ONE ANIMAL, 15% FOR TWO. CURRENTLY NOT ACCEPTING CREDIT CARDS. Administrative fee acts like Security Deposit $200 .